15 years ago, Baker Lake rejected a bid by Cogema Resources for a proposed uranium mine (Kiggavik-Sissons) 80 kilometers west of the community. The new parent company, Areva, has recently opened up a public relations office in the town to raise community support and renew their bid. Titan Uranium is also meeting with community leaders and elders, and has plans to drill on eight mineral claims in the Thelon basin near Aberdeen Lake northwest of Baker Lake. Perhaps another strategic position in the global climate crisis and the marketing of new nuclear energy solutions involving the North. Such mines have brought boom and bust to northern communities in Saskatchewan since the Korean War and the increased demand for uranium as a weapons material. So far, the community of Baker Lake remains uninterested. CBC reports that the Inuit land claims organization, Nunavut Tunngavik, Inc., may be giving ground to uranium mining proposals near Baker Lake. 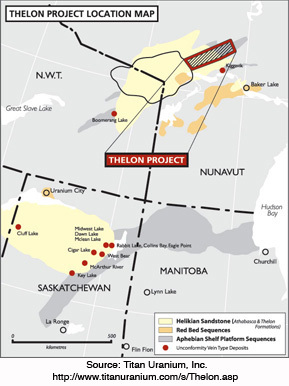 “With uranium prices on the rise, mining companies are showing renewed interest in deposits in the North.” Potential impact on the nearby Thelon Game Sanctuary is not yet known. Dene at Lutsel K’e continue to unilaterally oppose such developments. Northern News Services: “Primed for prosperity” (Dec. 12, 2007).